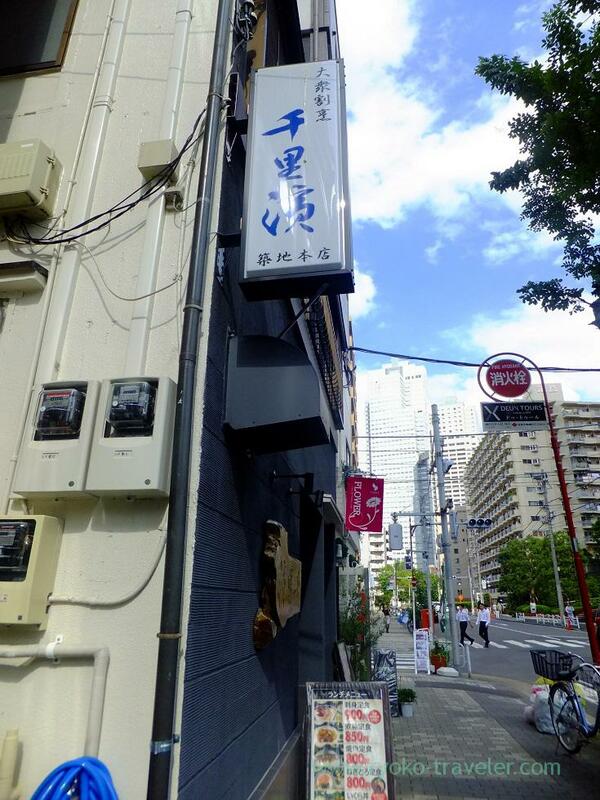 Chirihama honten that used to be located in Ginza area moved to Tsukiji area and they are open at lunchtime. So, many workers around Tsukiji already gather this restaurant at lunchtime. Chirihama was popular lunch spot at former location, too. 12 p.m. – 13 p.m. is lunchtime of many office workers in Japan, but even I go to there another time, there are always few vacant seats. I found this shop on my way to Hajime Sengyo-ten from my office. When you open the door, kitchen and counter seats welcome you. And Tables are at the back of the room. So, there’re many solo visitor at lunchtime. Maybe dinner time, too. There’s menus outside, and inside, too.But they don’t have English menu. “Chirihama (千里浜)” is place in Ishikawa prefecture. It’s port town. 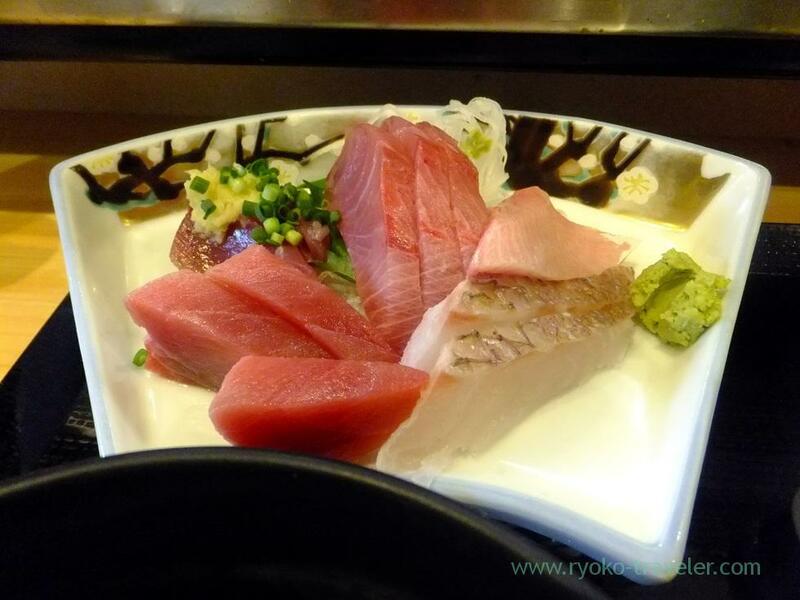 As its name, they serve good seafood from Tsukiji Market. They are located in such a convenient place. Both Tsukiji station and Kachidoki station is good to go there. Though I decided to order sashimi set, I heard the shop staff said that day’s grilled fish is saury ! I felt a little regret.Still that day’s my target was sashimi ! I ordered sashimi set (刺身定食, 900 yen). 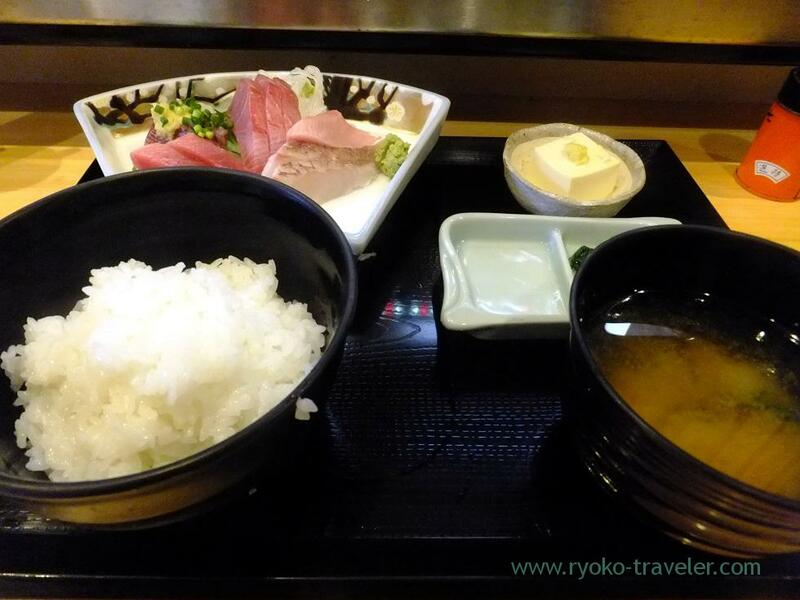 It have assorted sashimi (4 kinds of fish), tofu (Hiyayakko), rice, pickled vegetables and miso soup. And also if you want to eat both sashimi and (grilled or boiled) fish, I recommend Chirihama set (千里浜セット, 1200 yen) ! *Chirihama is located outside of Tsukiji Market, so they won’t move ! Open / 11 a.m. – 2 p.m., 5 p.m. – 10:30 p.m.